You’re on LinkedIn – congratulations! So, how big is your network? Without going into a rant on quality vs. quantity (who says we can’t have BOTH? ), let’s take a different angle on the size of your LinkedIn network…at your current company, where do you rank in terms of number of connections? Do you know off the top of your head? Why not? Voila! Now you know where you stand in your company in terms of LinkedIn network size. When I perform that exercise, I can see I am currently the most connected person in my firm. Try it yourself – check out some companies, peers, and competitors and see who the top 10 most connected are. You’ll find it’s not alway who you would expect! If someone claims to be a social recruiting “expert,” IMHO they had better be #1 in their company, or at the very least not behind anyone NOT in recruiting. 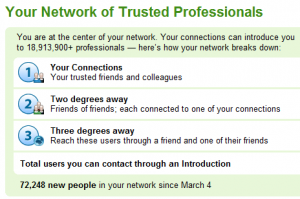 So, I ask again – where do you rank in terms of number of connections with regard to other people in your organization? If you’re NOT #1 in your company, why not, and who is? As a reader of my blog, I’m assuming you fit somewhere in the sourcing/recruiting/talent acquisition space – and having a decent sized network on LinkedIn allows you to run searches taking full advantage of LinkedIn’s search interface instead of having to resort to the imprecise science of X-Ray searching LinkedIn to view results of people outside of your network. I say imprecise science because when you attempt to target current titles and/or companies via an X-Ray search of LinkedIn, you’re not actually finding all of the available results. Trust me – you’re not. Of course, if you have a premium account with LinkedIn or you have access to LinkedIn Recruiter or LinkedIn Recruiter Professional Services, you may be able to see more (even all) search results. However, that still doesn’t answer the question as to why you don’t have the largest LinkedIn network of connections when compared to your peers in your current organization. No – it’s not a contest to see who can build the biggest LinkedIn network, and there is no magic number of connections you need to have. However, LinkedIn isn’t Facebook – it’s primarily a professional networking site. You don’t have to be best friends with someone to include them in your network. In fact, many would argue that it’s beneficial to network with people on LinkedIn you don’t know personally because of the simple fact that it expands your network reach and view. Is connecting with someone you don’t personally know really any different than going to a live, in-person networking event (or seminar, or conference, etc.) and receiving a list of the contact information of everyone who attended, whether you had a chance to mingle with them or not? Is having the ability to easily reach out to and network with people you don’t know any less “social” than networking only with people you already know? It could easily be argued that it’s anti-social to not connect with people you haven’t already met, spoken with, or exchanged online messages with. Not connecting with someone unless you already “know” them just like having a rule that you won’t talk to someone over the phone unless you’ve already met them in person. Who is to judge what connection has to be made first (phone/in-person/email/LinkedIn)? Do you have to be the most connected person in your company when it comes to LinkedIn? Of course not. However, it’s a worthy excerise to examine why and how someone else in your company has a bigger network than you, especially if they aren’t in some kind of talent identification and acquisition role (doh!). If you happen to benefit from an employer that affords you premium access to LinkedIn (e.g., LinkedIn Recruiter) – what happens if you leave your current employer and join a company that doesn’t have LinkedIn Recruiter? For those who only have a free account on LinkedIn – having a large network can mean not having to run an X-Ray search 95% of the time, regardless of location or skillset searched for. Without a premium account, the question may ultimately be what percent of the LinkedIn database do you want to be able to “see” without having to resort to X-Ray searching? Connecting with people on LinkedIn with relevant skills and experience (i.e., your target talent pool), whether you already “know” them or not, has obvious benefits. However, the benefits of connecting with people who don’t have relevant skills and experience (i.e., NOT your target talent pool) aren’t so obvious. In fact – some people would say it doesn’t make sense to connect with people who aren’t in your target talent pool.